Beginne mit unserem Starter Pack und biete viele Möglichkeiten, die Fantasie zu hinterfragen und kreative Designs zu erstellen. X Block ist CE-gekennzeichnet und als Spielzeug zugelassen. Vi introducerer X 4 i 2018. Str. 22,5 x 22,5 x 22,5 cm. X 4 er halvdelen af en X 8 klods. Den kan kombineres med andre klodser på alle 6 leder. 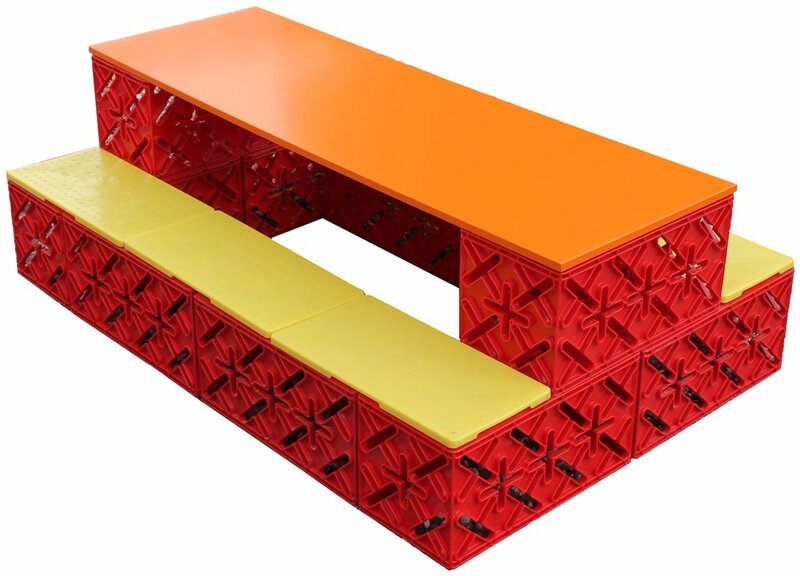 The X TABLE LOW PACK is on stock from medio March. 10 pcs. X8 Blocks, 6 pcs. X Board and 1 pcs. X Table. Build a table where the children can sit and draw or eat their food. There are plenty of options with X Block. Order the X Table Low Pack from your preferred distributor. REMEMBER! We continuously update the tab "building options" so that you can always find inspiration for fun constructions and activities. The X Table High Pack is on stock medio March. 18 pcs. X8 Blocks, 6 pcs. X Board and 1 pcs. X Table. Order the X Table High Pack from your preferred distributor.